Summary: This walk is one where navigation has to be precise and one in which position checking must be regularly observed as there are many places where there track to take is not obvious and sometimes the way forward can be deceptively hidden. There are also sections of tough walking where gorse and fern have overgrown the rarely used paths. 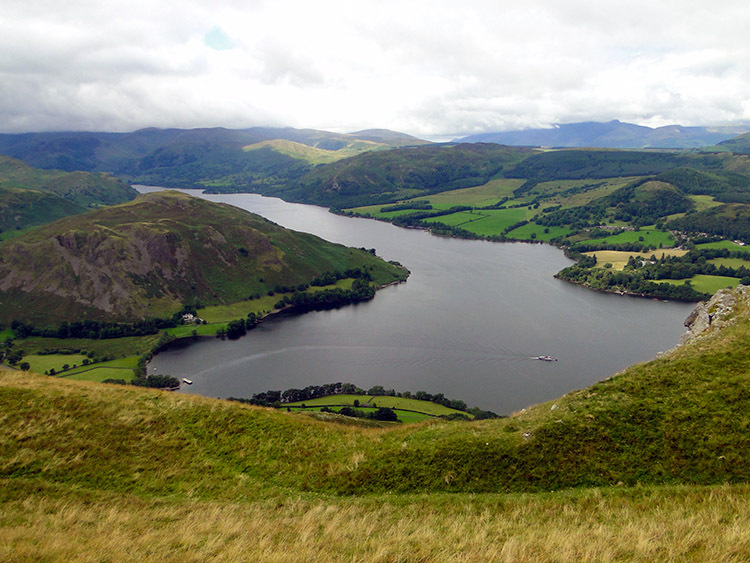 But these points aside the walk is one that provides tremendous views of the surrounding fells and also accesses the most spectacular views of Ullswater. There is also a section of walking in history as the Romans did on their high street over Lakeland. 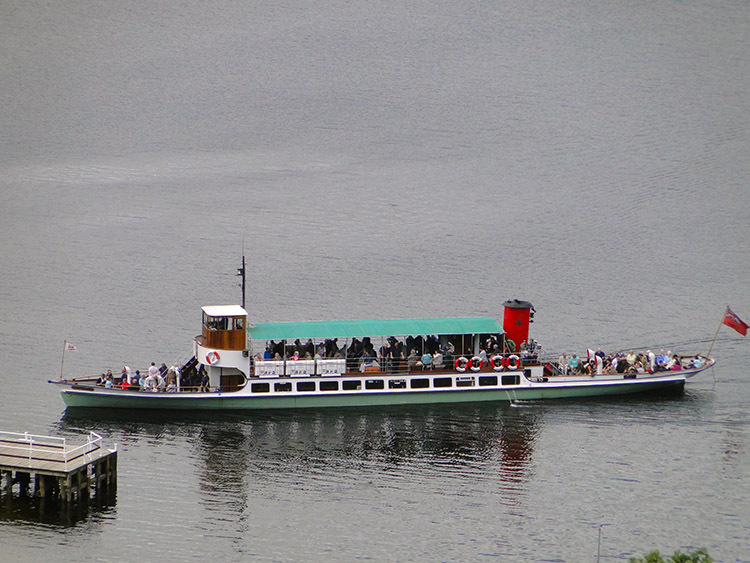 Also enjoy the pleasure of effort when you look down to visitors enjoying a pleasure cruise on the Ullswater steamer. The Walk: After three marvellous dry and mainly sunny days walking in the Lake District on the 'Boys 2nd Annual Lake District Walking Adventure' we woke on the final day to find the weather had deteriorated. As we breakfasted at our super Glendale House B&B in Penrith we looked out on overcast skies and rain. Steve commented "I have never been on a walking break in the Lake District without a day's walking in rain" He had been convinced one of the walks we did on the summer holidays would be a lowland venture, typically around a Lake but the forecast was for improving skies and I was not giving up on the planned walk yet. This was going to be different Steve, four walks in decent weather and four walks to height. 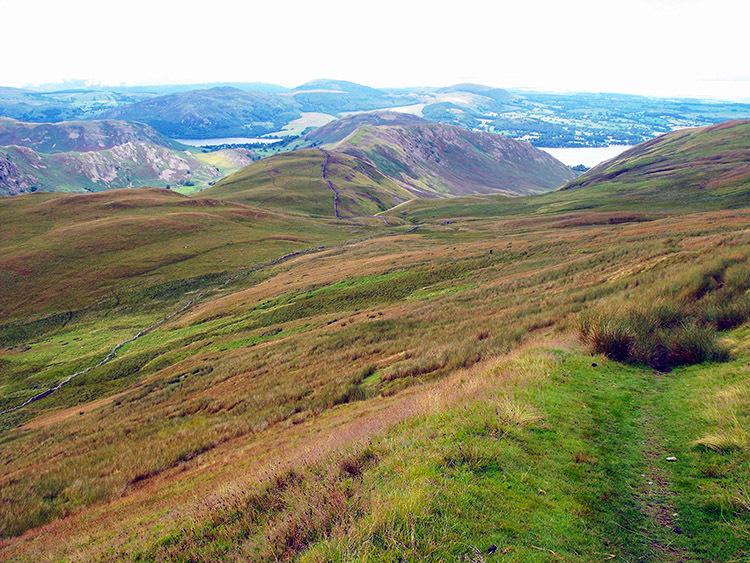 The walk I had planned was on the fells south of Ullswater with a start in Howtown or Martindale. 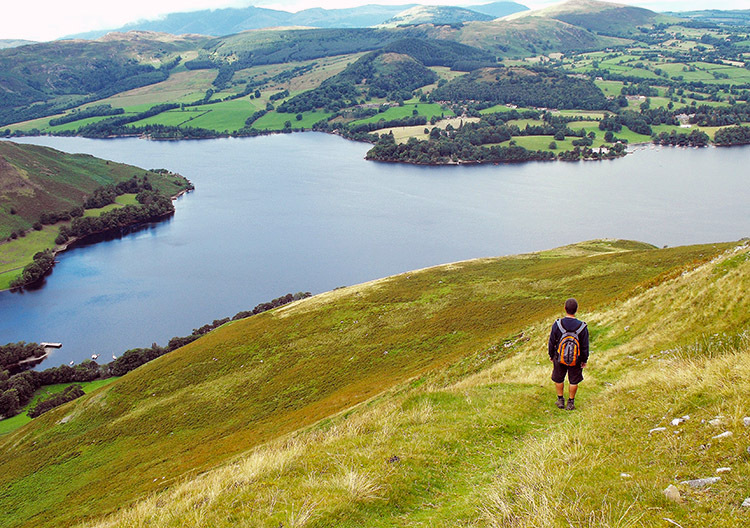 If we got there and things were bad we could revert to climbing Hallin Fell and adventuring on lakeside paths. But I was not planning on doing that and to their credit Steve, Chris and Dave did not want to either. We called at the temporary Morrison's Supermarket in Penrith for food and drink with rain still piddling down but as we drove to Pooley Bridge and then along the south side road to Howtown things improved. The rain stopped and the cloud level was over 1,000 feet. We decided to go for it. Our night out in Penrith had been a rather wild affair and after parking the car up near Martindale Church we were not exactly rushing to get going. Spirits were high but bodies were not as sprightly as we set off at a stuttering pace and just as a drizzling rain begun. 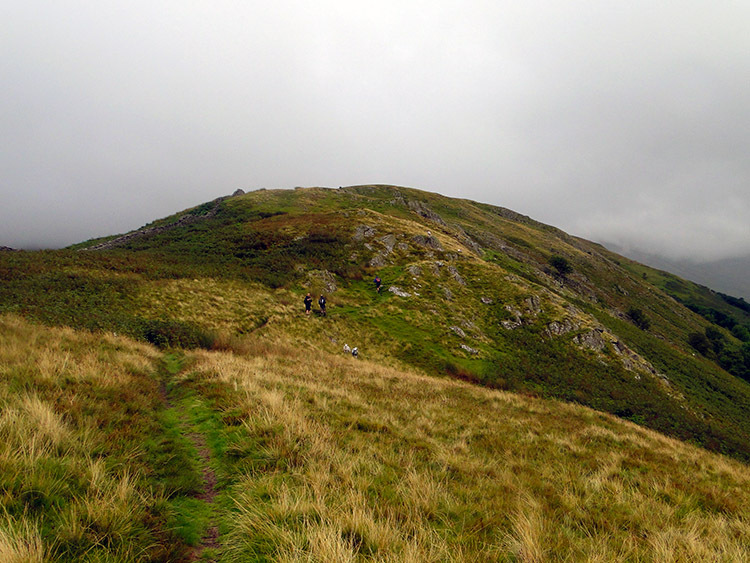 Still the cloud level was continuing to rise and as we walked into the enclosure of Martindale the Nab was directly in our eyesight with cloud hovering near the Nab's summit; the cloud level had risen to nearer 1,500 feet and was continuing to lift. The lifting of the clouds did not stop a raincloud passing directly over us though as we ascended from Martindale to Brownthwaite Crag. The ascent on a narrow path through wet ferns was uncomfortable; we had to put our raincoats on for the only occasion of the trip and right on the last day. Rain continued and it ran down my trousers, percolating into my socks and filling my boots. It was unsettling and all I wanted to do was follow the path and gain height. 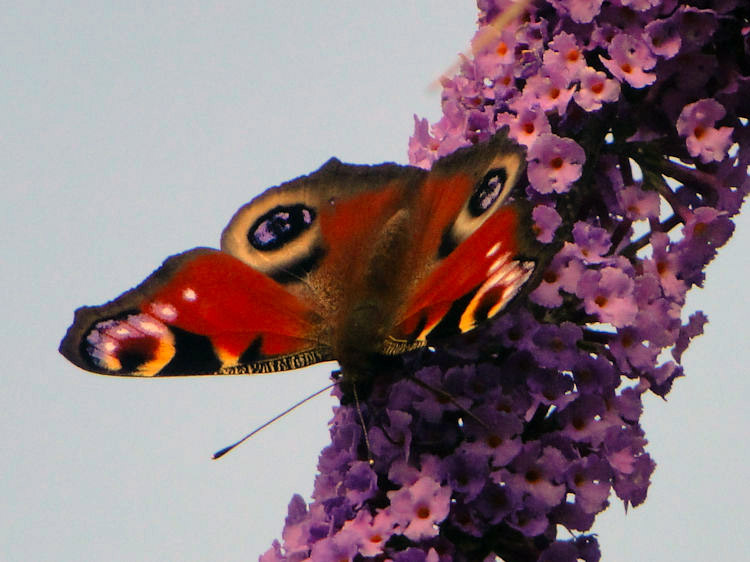 Unfortunately after three days of good walking I was on form and made good ground – so why unfortunate? I will explain in a moment. 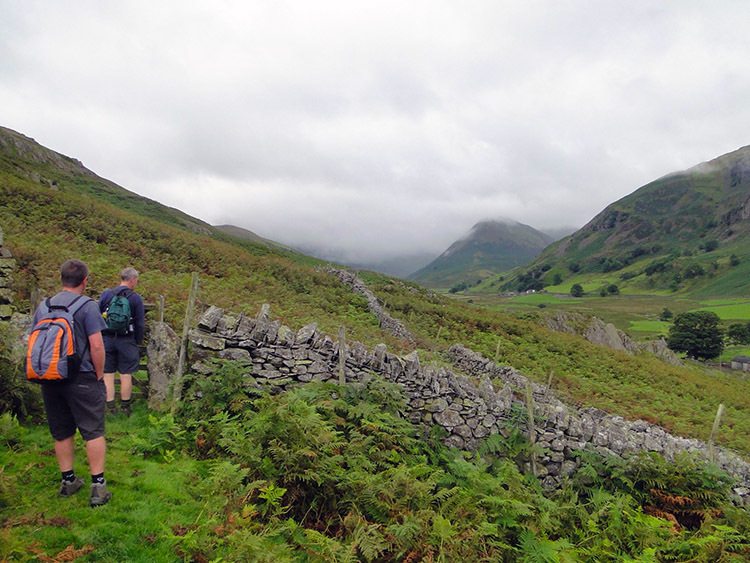 We all strode on through the fern line and out of the ferns at Brownthwaite Crag. We walked past the crag and on but then a nasty thought hit me and I paused. I knew from memory the main hills planned for the day were Wether Hill and Loadpot Hill but there were other hills of interest to complete. 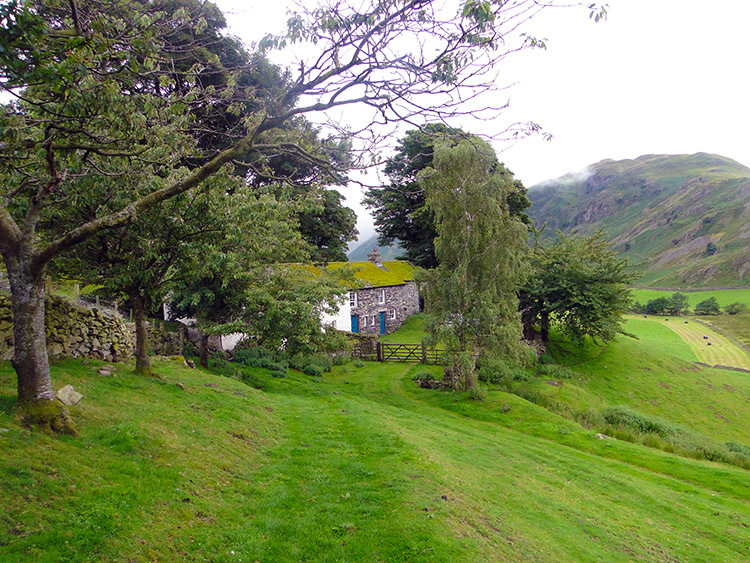 One of the most appealing was Steel Knotts and on making a direct line for Brownthwaite Crag we had missed it. Steve and Chris were about 50 yards ahead so I checked the map and pointed it out to Dave saying "Dave, I must go back and bag Steel Knotts while I am here" In the quick conversation Dave had misunderstood thinking the top of Brownthwaite Crag was my goal, a mere 100 yards away. Steel Knotts was almost a kilometre back! Drat, damn, blast I though but off I went without a thought and being in good form I bounded my way towards the target. Unknowing of my new course Steve and Chris halted and Dave told them I had tracked back 100 yards. I can only wonder their thoughts when I did not return soon and I am betting they were not pleasant. However I did not care, I was on a mission and soon I had made the distance and the climb to Steel Knotts. And it was so worth the effort. Wainwright explains why. First he describes the summit "Steel Knotts may well claim to have the sharpest summit in Lakeland, for the rock tor (Pikeawassa) that crowns the top is so acute that only very agile walkers will be able to stand upon it, although, it will be noted, it is a popular perch for birds. There is no Cairn" - note there was a wee cairn of one single stone on my visit. Wainwright's next complementary description is of the view "This is the best viewpoint in the upper Martindale district, the highlight of a charming scene being the confluence of the remote Rampsgill and Bannerdale valleys" I stayed long enough to take a few pictures, a short video and to take it in before scampering off back to the lads who were on the western flank of Wether Hill. As I rounded Brownthwaite Crag for the second time I spotted the three amigos about a half mile ahead. Cloud had continued to rise during my adventure off on my own and rain had abated permanently with the top of Wether Fell just cleared of the cloud line which had risen over the height of the hill. Had I not defaulted then we would have certainly walked in cloud. As it was I inadvertently kept us below it, a Pyrrhic triumph. I continued on slowly hauling the lads in as I passed close to Gowk Hill and followed a path to Keasgill Head on the High Street Roman Road. At Keasgill Head I rejoined the group who rightly scolded me for going off without a clear description of what I was up to. I was told off but I was still chuffed; standing on top of Steel Knotts was a brilliant moment and one when the clouds seemed to part and the views open out. Now rejoined we lunched by a wall for shelter from the wind as we were now on the top of open fell with practically all the days climbing done. A high level walk to Wether Hill and Loadpot Hill were imminent and then two more points of high enjoyment at Arthur's Pike and Bonscale Pike. So lunched up we headed off along High Street to the summit of Wether Hill. While on the Roman road I imagined I was Caesar with Dave, Chris and Steve my Praetorian Guard. We saw off the savages in our imaginations, or at least mine, while walking over the humps and bumps of otherwise featureless terrain to Loadpot Hill. 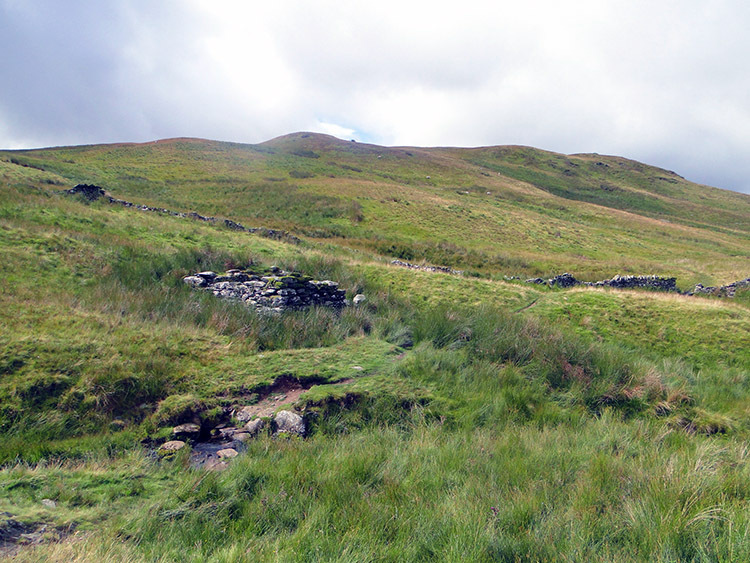 Signs of life were absent and Wainwright notes these fells as devoid of people now, apart from fell walkers but he explains that was not always the case as this area is strewn with antiquities. As for antiquities there is a stone circle near Swarthbeck Gill (which we passed closely by without seeing the stones) and Druid's settlement remains on Moor Divock on the eastern flanks of the hill. We saw them neither as we headed to Arthur's Pike and a most beguiling view. 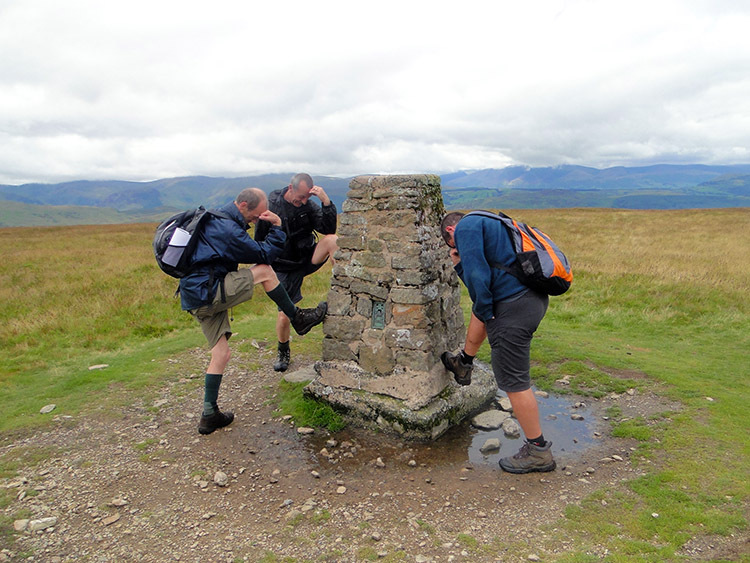 Arthur's Pike is at the northern termination of the High Street range with a summit of fabulous sights to the south and west with full unbroken views of the Helvellyn and Fairfield ranges. I pointed the Dodd's and Clough Head to the boys, the high fells we were walking on 24 hours earlier. It was a satisfying feeling. Looking down the north side of Ullswater and Pooley Bridge were in view. It was a lovely sight after the efforts of the enclosed high level walk over Wether Hill and Loadpot Hill. More satisfying was the splendour of the weather as the sun had now broken through to give us a wonderful sunny afternoon. 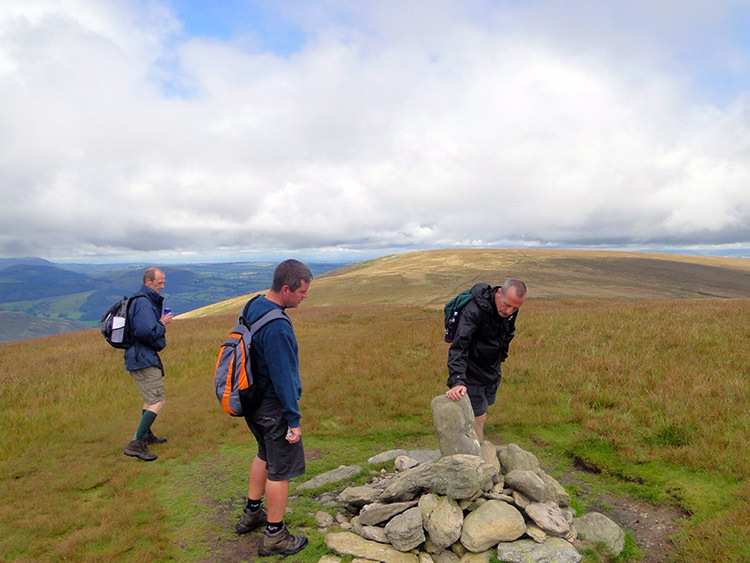 Steve had got his unexpected wish; four superb walking days in the Lake District! From Arthur's Pike we cut across the fell to nearby Bonscale Pike which gave us similar views but subtle different aspects of Ullswater including a great view of the middle reach. 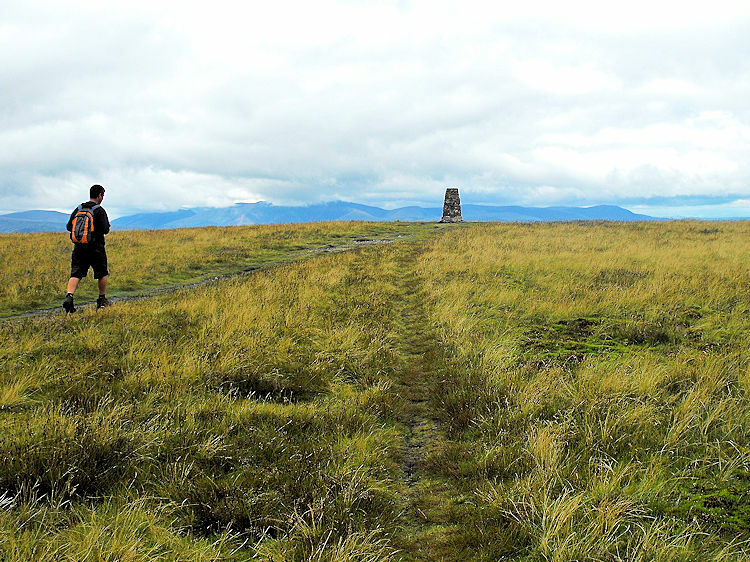 Bonscale Pike was also our last Wainwright Fell of the 2010 adventure and an 18th new one for me. I was extremely chuffed. I reckon the boys were too. From Bonscale Fell we had to make our way off the high ground and down to Howtown, but how? There were no clear tracks down and no marked paths and the flank we were looking at seemed terribly steep. We skirted along the edge of the fell top looking for signs of paths and after a couple of false hopes Chris spotted a potential way down. Steve and Dave followed gingerly at first with me in their wake but soon Chris's decent became more assured and the view of a proper path down was obvious. Still it was a steep descent with the knees having to work hard to contain the impact as we braked our way down and down the mountainside. On the OS Explorer OL5 1:25000 map you will see the path we took which bisects White Knotts (NY196452) and Swarth Fell (NY199452) as it zigzags you down to Mellguards near Howtown. Our tough descent was compensated by incredible views of the Ullswater area and as an added bonus to the finale of our Lake District visit the Ullswater Steamer came in to Howtown Pier to disembark some passengers and allow board to others. 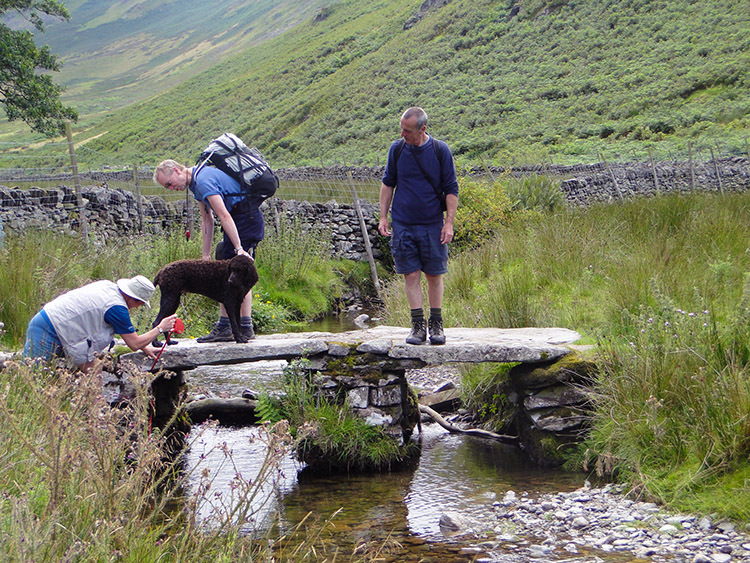 For us it was plain sailing on our feet on a lovely path intersecting the Coombs on our way back to Martindale. While the walk to the finish was plain sailing for us it was not for a couple with a dog on a lead. The dogs lead had got caught in a Clapper Bridge, probably due to the canine wanting a dip in the beck which the bridge spanned. It was quite a job freeing the family pet. Eventually they did so. A final delight for us was enjoyed immediately after the incident as we enjoyed perfect views of Hallin Fell, one of the most popular fells frequented by amblers who park their cars and stroll up in a few minutes. 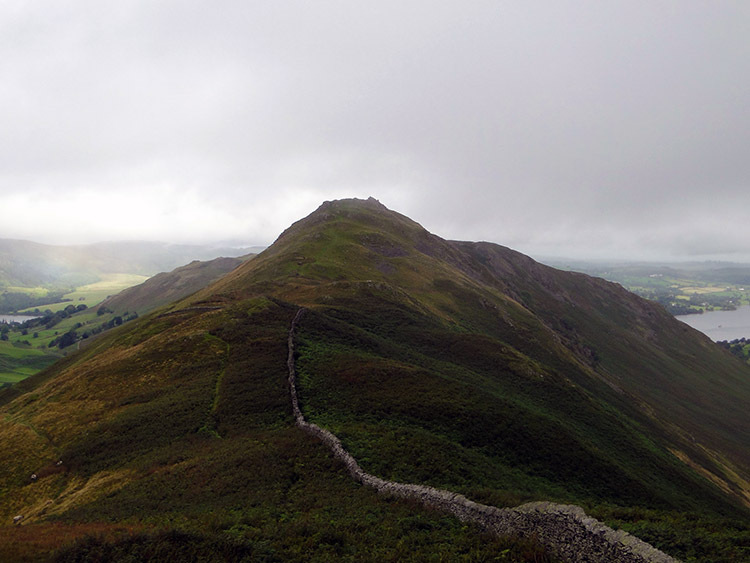 It is one of the Wainwright Fells I have to take my wife Lil to the top of on a clear day. For us our walk was done and sadly the last of four continuous days walking in this beautiful National Park. I am scarcely disappointed from walks in the Lake District and while this one was not to the highest or most famous mountains it had it's own personal charm. For me the start and the mishaps of Steel Knotts were particularly memorable and for us all I am sure the views to Ullswater from the final peaks and the exciting descent will abide. Until the next time..